Unmanned Aerial Systems (UAS), or “drones,” have emerged as a new technology of interest both for hobbyists, and more importantly for possible research, academic, and commercial uses at Duke. Members of the Duke community are prepared to use drones for a variety of purposes. This policy will offer guidance regarding the type of drone operations acceptable and processes for requesting permission to operate drones on Duke property or for Duke purposes. All operation and use of drones anywhere in US airspace by members of the Duke community for Duke-affiliated activities must comply with FAA regulations and local, state, and federal laws regarding use of drones. Specifically, Duke has applied for and received an exemption under Section 333 UAS which requires a pilot’s license. However, many of the use cases envisioned at Duke fall under Part 107 rules, which require a “remote pilot airman certificate with a small UAS rating,” which is relatively easy to obtain. All potential use of drones, including small drones and model aircraft, on university property must additionally follow Duke-specific procedures as specified below. Indoor uses of small drones for research and teaching purposes are permitted when responsible faculty or other space owners have determined that the proposed space is suitable for such experimentation. The risk management office is to be consulted if there is any uncertainty in this determination. Outdoor uses of drones for research, teaching, or operational activities of the university may be proposed by members of the university community. Drone operations over Duke property or under the Duke Section 333 exemption will be coordinated through the Flight Request process. First-time requestors of drone flights may submit a request form to collect required information. The review team will consult with the Office of Risk Management, LifeFlight operations, and other university resources as appropriate to review the request. The review team will determine if the proposed flight(s) have been correctly classified as falling under the educational exemption, Part 107 rules, or Duke’s Section 333 Exemption. The team will determine if the requestors have the qualifications appropriate for the type of flight requested and that they can ensure the safety of participants, non-participants, and university property. Requests for recurring flights can potentially be granted with an agreed per-flight notification process, or may be deemed to require case-by-case reconsideration. The review process will be conducted in as timely a manner as is practical. 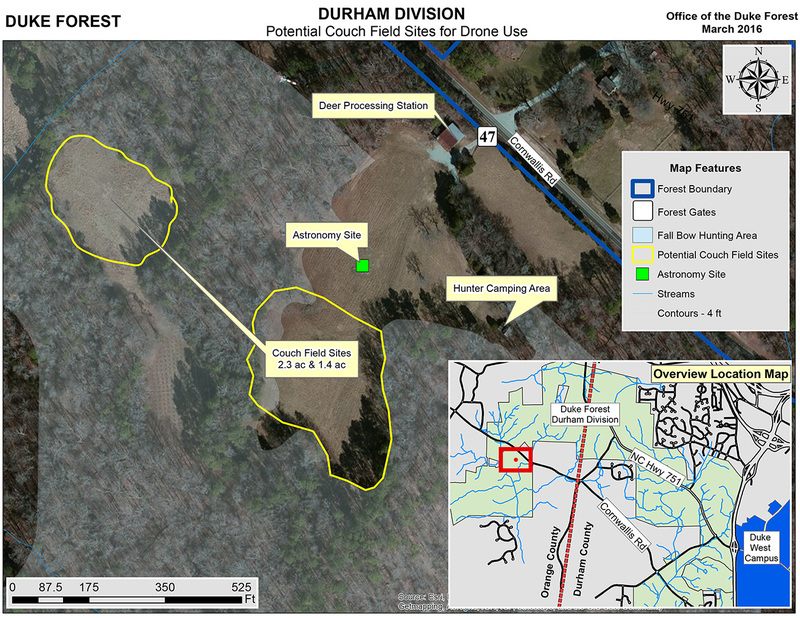 Two areas in Duke Forest near the main campus have been prescreened as suitable for certain kinds of drone operations at certain times of year. 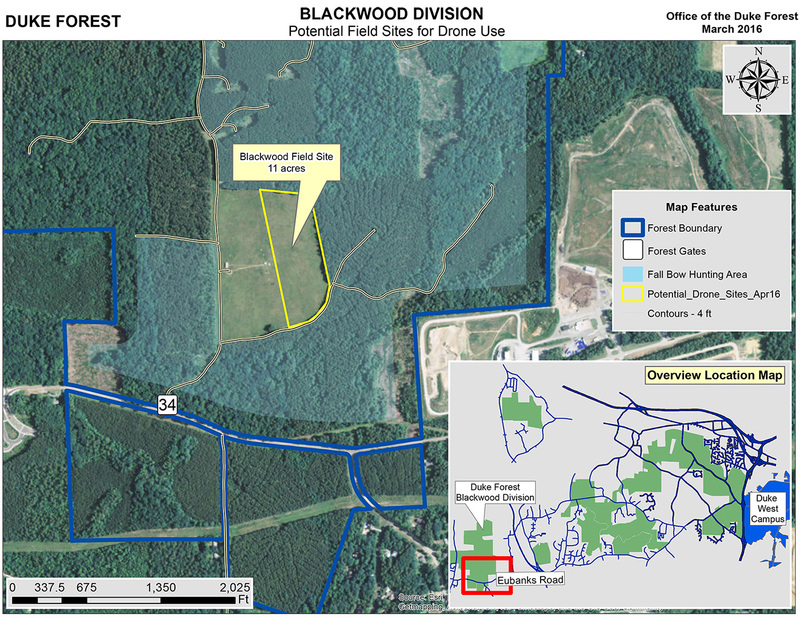 These areas are the Couch and Blackwood field sites. Requests to conduct flights in these areas will follow the same process outlined above, but approval is expected to be more streamlined. Details of those areas are coming soon. For flights in US airspace not over Duke property, the operators are responsible for obtaining all required local permissions and following any additional state and local laws and procedures. Flights in North Carolina, in particular, require written permission from property owners before aerial photography takes place over their land. For all kinds of drone flights, operators are responsible for conducting airworthiness and safety checks, and assessing weather conditions, prior to each flight as mandated by the various regulations. Research flights conducted anywhere in US airspace under our Section 333 exemption have additional requirements as specified by our Certificate of Waiver or Authorization (COA,) including (but not limited to) the issuance of appropriate “Notice to Airmen” 24-72 hours prior to each flight, and a rigorous flight reporting regime. Each flight conducted under the Section 333 exemption must be reported to the Office of the Vice Provost for Research to facilitate timely reporting to the FAA; details of this reporting process will be provided as part of the request approval. Hobbyist use of drones are permitted under certain circumstances under current FAA rules without an exemption or a pilot’s license, but all potential hobbyist use on Duke’s campuses must be authorized. Established amateur aviation societies bring a strong culture of training, safety, and responsible operation to drone activities. Duke will consider authorizing hobbyist flights at such time as a Duke chapter of the Academy of Model Aeronautics or if a similar organization is established. When such an entity exists, and the Office of Risk Management has reviewed and approved the group’s training procedures and flight safety protocols, the group can apply to conduct flights following the process specified above. When flying away from Duke property, Duke-affiliated hobbyists are acting as individuals, and not as members of a Duke-affiliated organization. Unauthorized uses on university property are all uses not approved by the processes described above; DUPD will act on any reports of unauthorized UAS flights and seek to end them. Flights near heavily populated areas (i.e. stadiums) are always unauthorized. Nonaffiliated violators may be subject to trespass. Affiliated violators may be subject to university disciplinary process. Violations may be reported to the FAA consistent with federal guidance and may be charged as violations of state law. The legal and regulatory framework around drone use has evolved rapidly. Under present FAA rules, outdoor commercial use of drones is subject to one of three possible regulatory paths, depending on details of the use. FAA rules include research and curricular uses, as well as operational uses for maintenance, publicity, public safety, etc. Flights for purely educational purposes are now treated much like hobbyist use, as further defined and detailed in an FAA memorandum issued in May 2016. Flights for research or operational purposes can fall either under the new “Part 107” rules that became effective in August 2016, or if the flight parameters exceed those permitted under Part 107, they are governed by the previous “Section 333 Exemption” process. The distinctions in the latter two categories are important. Flights falling under Part 107 can be piloted by someone possessing a “remote pilot airman certificate with a small UAS rating,” which is easy to obtain, whereas Section 333 flights require a licensed pilot. Duke has applied for and received a Section 333 UAS exemption, however many of the use cases envisioned at Duke fall under Part 107 rules. Additionally, there are restrictions on the flights Duke can conduct, their locations (proximity to airports), and the kinds of data Duke gathers. The exemption and its terms apply to flights anywhere in US airspace, not just to flights over Duke property. The blanket “Certificate of Waiver or Authorization” (COA) from the FAA that accompanies our exemption additionally mandates a highly regulated process of notifications to the air traffic control system of each prospective UAS flight, 24 hours in advance, and also specifies a regime of monthly reporting of details of all flights conducted under the exemption anywhere in US airspace. If a member of the Duke community wants to conduct flights that do not fit either Part 107 rules our our current Section 333 exemption, it is possible for Duke to apply to amend its exemption to include new vehicle types and possibly relaxed flight rule restrictions; this process does have a long lead time and is not guaranteed. The office of the Vice Provost for Research in conjunction with the V.P. of Administration, Counsel, Risk Management, and other university offices will work to coordinate the management of our exemption(s) going forward. The State of North Carolina has its own additional requirements for drone activities. A permit is required for commercial drone operations in North Carolina and potential drone operators must pass the NCDOT UAS knowledge test as part of the permitting process. Visit the NCDOT for more information on state regulations.